Creative inspiration for some members of LCS’ Post-Void Radio Theater originated listening to record albums by The Firesign Theatre and Stan Freberg. The recent passing of FT’s Phil Austin, and the death of Stan Freberg (wrote & starred in network radio’s last great comedy series–replacing Jack Benny who left radio for TV) prompted discussion between Post-Void participants investigating the why of radio as means of expressing themselves. What were the listening influences of Peter Stenshoel, Damon Mathews, Jeff Pike, Stu Mathews & Jerry? Peter: Old time radio was already in my blood. Along with Freberg. 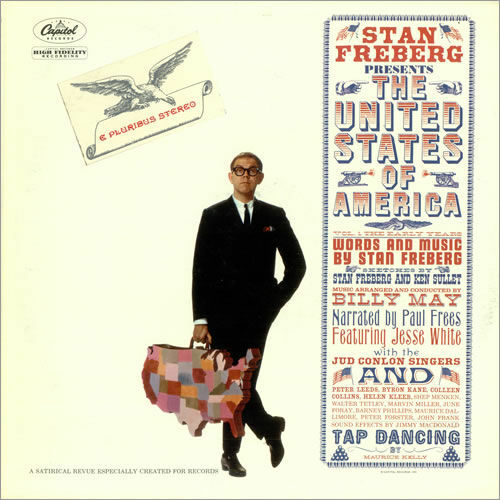 First album heard was Stan Freberg Presents the United States of America, the year it was released! (1961) And Bob & Ray. Damon: Bob & Ray forever! Bob & Ray were, still are, and probably always will be my shining stars. I took an interest in old time radio so far back you had to get episodes on LP records. But cassettes arrived about two minutes later & I was off & running after that. Jerry: My buddy Mark Masyga and I started taping OTR on cassette around 1972 when re-runs were programmed on commercial radio: Lacrosse, Wisconsin AM radio ritually re-broadcast The Shadow, Green Hornet, Lone Ranger, Fibber McGee & Molly. Then-current CBS Radio Mystery Theater was text book “here’s how it’s done” and I kept a log of each episode title for quite a while. Now you can listen to them at archive.org. Peter: Miriam and I discovered CBS Radio Mystery Theater on Far East Network the 3 months living in Tokyo. A really fun ritual! Stu: I think I was just seven, maybe eight years old (’61-‘62) when my grandmother Jewell Vowel thrilled me by sending me a “miniature” transistor radio for my birthday. I found out that I could put the radio under my pillow, and then, laying my head with my ear directly over the speaker, I could keep it low enough. That’s when I had my most fascinating listening sessions…listening to places like Philadelphia, New York, and Chicago. It’s where I first heard the Motown sound and the girl groups that were popular, including the first time I heard The Supremes. To me, it didn’t seem like these sounds were coming from a specific place. The experience seemed so mysterious to me that I felt these songs and the announcers were just “out there,” like voices from outer space (imagine that). 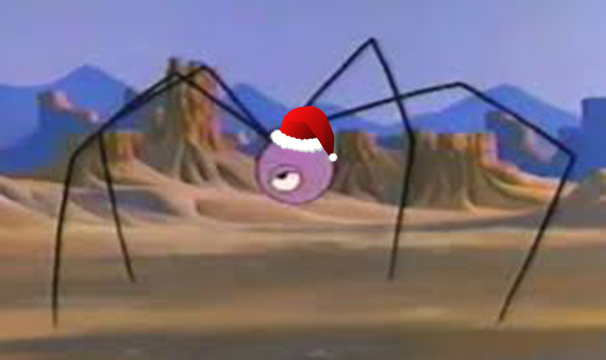 Jerry: Also KAAY-Little Rock. Freberg’s 1957 network radio show re-played on WCCO-FM, I strung a copper wire across the kitchen ceiling & on good nights in Winona listened intently. Damon: Stringing wire in the kitchen to get WCCO is such beautiful music to my ears! I spent a good chunk of childhood fascinated with both the content and technology of radio. Peter: I got a crystal radio set for my birthday when I was ten. That was just awesome. Later, the famous Jim Gilbert was my then not-famous science teacher who started a ham radio club with a few of us radio heads. Again, superb fun and thrills. My Morse code got good enough so I had my own “rig” in my room and I was WNOBJX. Damon: That’s great that you got to be a ham in the days when it was really unique to connect to other countries. I had a Heathkit receiver that I built when I was about 9. Peter: I also “built” a Heathkit receiver (my Dad did most of the soldering!) which was part of my rig. Bought a used transmitter…so cool! My Heathkit receiver allowed me to hear shortwave radio. Voice of America played Frank Zappa’s Concerto for John Luc Ponty. Jerry: Looking for the elusive & interesting radio signals in the old days…like spelunking in a dark cave! The heart would race when happening upon something interesting! Stu: Now that Peter Bergman & Phil Austin have passed away, I feel compelled to emphasize that, although I consider the Post-Void Radio Theater to be our own, there’s no use in denying how brave this foursome was to commit to their muses and boldly go where no comedic group had gone before, and not give a damn whether people approved or not. For me, they were The Beatles of a new kind of unfettered creativity that could be called as much Performance Art as it is Comedy. It is so vivid to me, my memory of the evening that Peter & David Stenshoel invited me to listen to a double-vinyl album they had acquired, called Dear Friends. We lounged around in their parents’ bedroom listening to four full album sides of four guys just doing whatever the hell they wanted to do, on the radio! I would never have been inspired to actually try to be funny – live – on the radio if I hadn’t heard Dear Friends, the only Firesign vinyl album that is just them goofing around on the airwaves. It was magic. It was more than magic. It changed my whole life paradigm. And I haven’t been the same since. Jerry: I was living in Waverly, Iowa working at a radio station, off-hours at home could pick up Rochester, Minnesota late night FM playing whole sides of rock music albums without interruption, they played FT’s Nick Danger from their second LP. Peter: I was speaking with a fellow at NPR West & he pointed out FT pre-dated Monty Python. 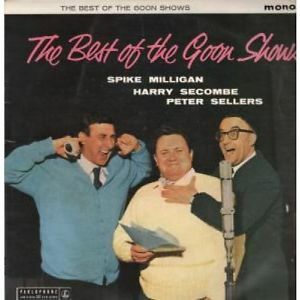 FT credited The Goon Show as inspirations. Maybe 1966 first heard The Goon Show and so I was well-primed when my brother David woke me up to hear the very surrealistic second side of FT’s Waiting for the Electrician. You didn’t have to be literate to enjoy it although you could understand more references if you were. FT’s David Ossman really admired the European avant-garde of the ’20s. And the ’50s. Ionesco, Beckett. Jeff: Being absurd on the radio is so much more effective than almost any other medium. Radio triggers the imagination so easily. They pitched it at this low-brow level with TV, mystery novel references. Peter: We could all instantly understand something of what they were doing, and yet there was always a mystery to it too. That absurdism translates beautifully in that medium. 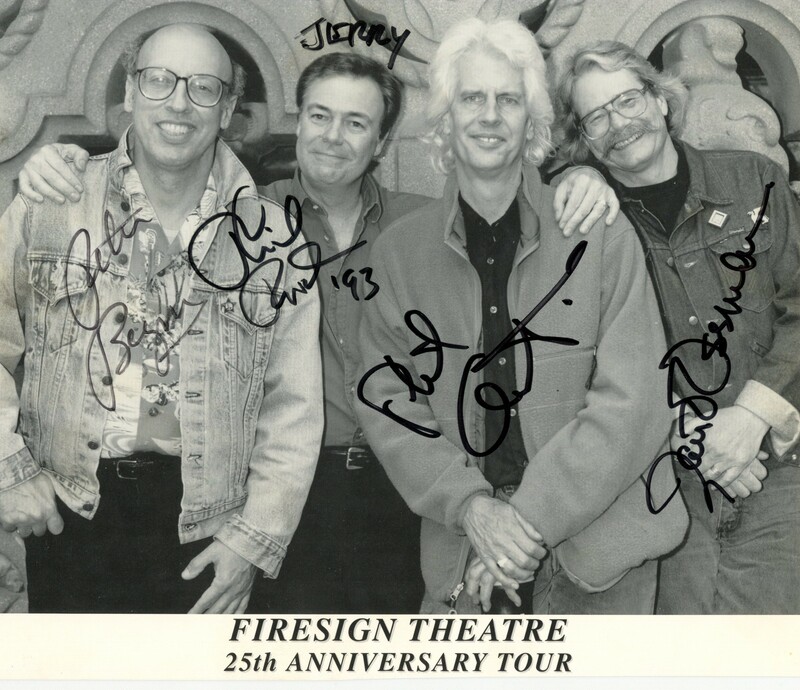 Jeff: Funny, without being heavy-handed, that’s what Firesign Theatre really did. Obviously we were influenced by them. They were so unique, and they mapped out these huge terrains. I’ve gone back and bought all their albums. Stu: If The Firesign Theatre had not happened, The Post-Void Radio Theater–and Little City in Space Show–would not have happened.